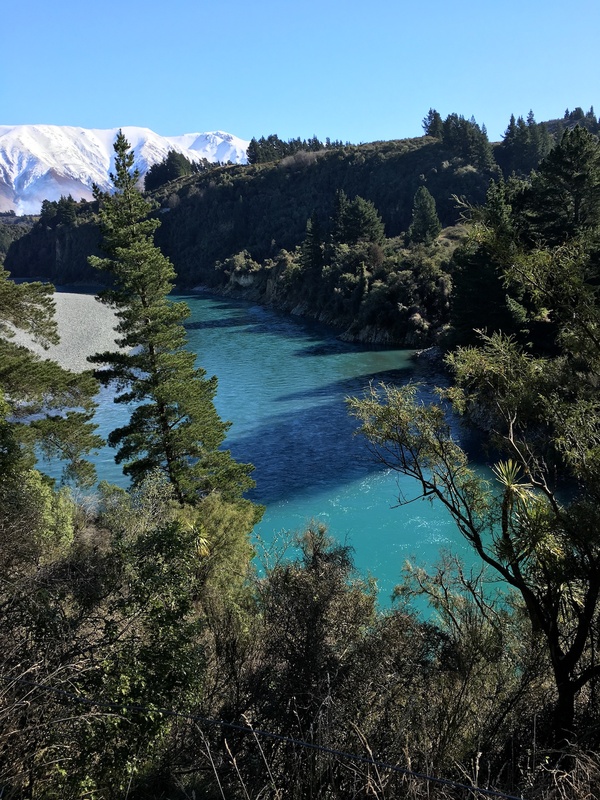 I’ve written and discarded half a dozen blog posts over the past week. Nothing seems to be quite right. Out of ideas, I resorted to the book of 500 writing prompts I created for my daughter. A random stab at the non-fiction section of the book brought me to the question: What objects tell the story of your life? The fiddle: made by a neighbour in Panama, given to me for my birthday by my husband. The fiddle not only tells the story of our years living and working among the incredible, resourceful people of Panama, but also tells the story of my lifelong interest in learning to play the violin…an interest which always ended up being pushed aside for other interests. Because I’m interested in learning so many things, there simply aren’t enough hours in the day. 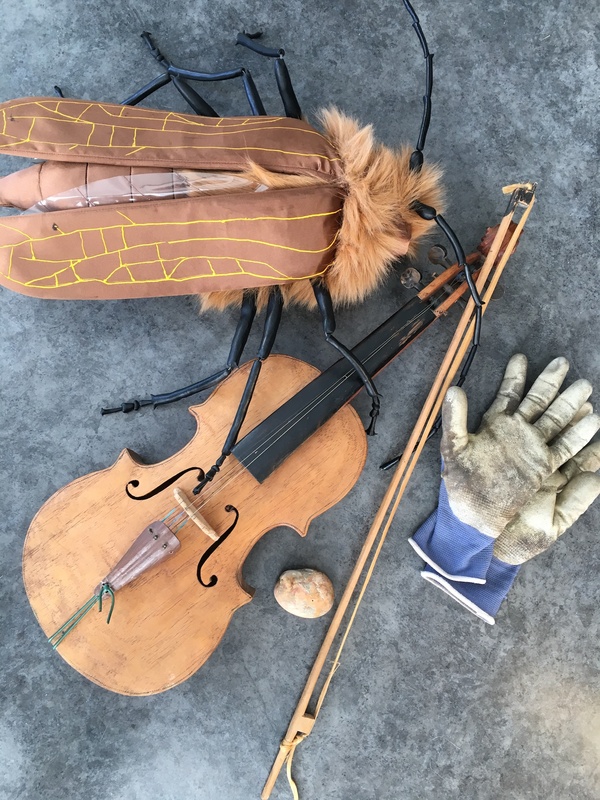 The beetle puppet represents my insatiable curiosity about arthropods, and how that curiosity has bled into my other interests. Peanut butter jars full of bugs on my dresser when I was a kid led to the entomology degree, which led to teaching about insects at Penn State University, and then starting the Bugmobile. And the puppet is only one of many insect-themed and inspired artistic projects I’ve done over the years, as art and science mingle in my brain. The gardening gloves speak of my weeding addiction and my love of growing food. The gloves are never more than a month or two old, because I wear through them in that time. I think that says it all about gardening for me. The rock represents adventure, the natural world, and the wild places I have visited and lived in. Like me, the rock has traveled far and has been changed by the stresses it has experienced along the way. My first skeins of mohair yarn, showing improvement from left to right. Not long ago I learned to spin. I should have learned earlier, right after my angora goats were shorn the first time, but I looked at all that mohair and lost heart—it was too much for me to deal with. So I dropped it off at a commercial spinner. A year later, the spinner still hadn’t spun my mohair and finally admitted they had no intention of ever getting to it, so I picked it back up and brought it home. It was time to learn to spin. At first I hated it. It was fiddly and frustrating. The resulting yarn, if you could even call it that, was thick and lumpy. I was set to give up on it. 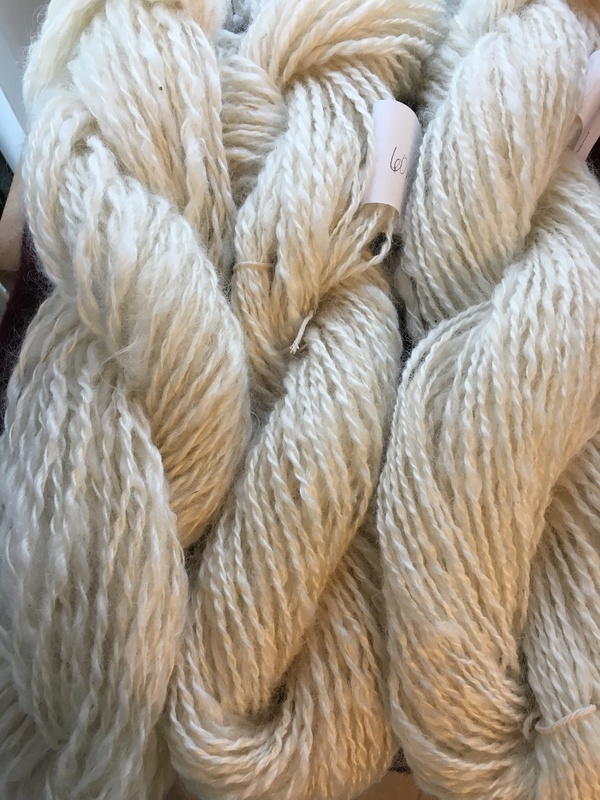 But a friend who spins encouraged me to keep working on it—it’s always hard at first, she said, and that lumpy thick yarn is beautiful and artistic in its own right. I took her advice, and kept at it. A hundred metres of thick lumpy yarn later, I suddenly found I was producing fairly consistent worsted-weight yarn. And I was enjoying it! Learning something new is never easy. I know I’ve blogged about this before, but it’s worth repeating. We watch accomplished people at the task, and we think, “I’d like to do that.” Then we try, and our efforts are fumbling, the results uninspired. It takes determination (and often encouragement from others) to push through the initial discouragement and get to the point where you can enjoy the new skill. I’ve tried to teach my kids that it’s worth pushing through that learning hump to gain a new skill. Sometimes I need reminding myself. I’ve had a fascination with reflective fabrics for a while. The amazing reflective fabrics being manufactured today have so many creative possibilities that I itch to get my hands on some of them. Unfortunately, most aren’t available here. Recently I managed to get my hands on some reflective fabric tape, and designed a new jacket with the tape in mind. But first I had to turn the tape into piping. Then I made a few test seams with the piping and the wind-block fleece I’d chosen for the jacket. 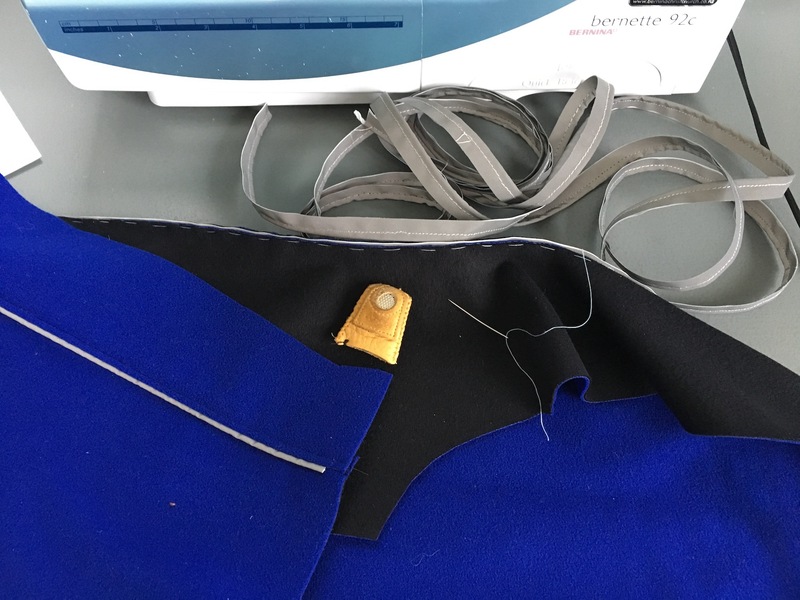 I found the combination of fabric and piping was singularly unforgiving—the fabric stretched too much, and the seam had to be sewn perfectly to look good. Even the slightest sloppiness caused it to look awful. That meant hand basting the piping to one side of the seam first, and then hand basting the seam together before sewing it on the machine. Then each seam needed topstitching to make the most of that precise seam. The upshot is that every seam on this jacket (to which I added seams for style purposes) has to be sewn five times (two of those times by hand through four layers of quite tough fabric). I’ll admit that by the time I’d managed the first seam (having had to rip it out twice because it wasn’t perfect), I was nearly ready to scrap the project. Then I looked at the gorgeous seam I’d just finished. When I finally do complete this garment, it’s going to be lovely. I’ve chosen fabric I know will look good for a decade or more of hard use. Its reflective piping will give me a measure of safety for the nighttime walks I enjoy. It will be warm, windproof and nearly waterproof. Yes, it will take me quite a bit longer than I’d hoped to make. But, as they say, good things take time. I do a fair bit of crafting—I weave, sew, knit, embroider, etc.—but almost all of what I create is useful. Clothing, rugs, bags, household furnishings … if I need something, I make it. It’s unusual for me to create something with no utility at all. Maybe that’s why I had so much fun making this fabric collage wall hanging. 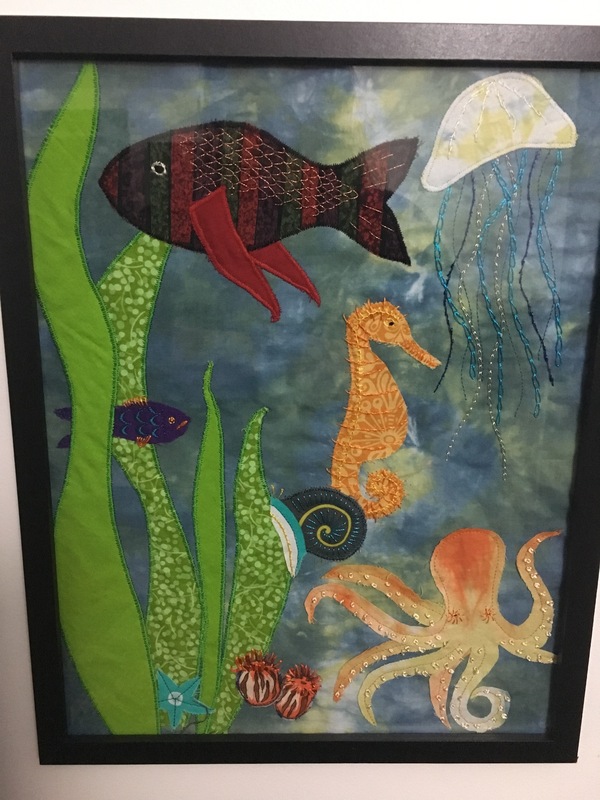 There is no purpose for this piece of whimsy, beyond fitting the ocean theme my husband declared for the new family ‘art installation’ in the living room. 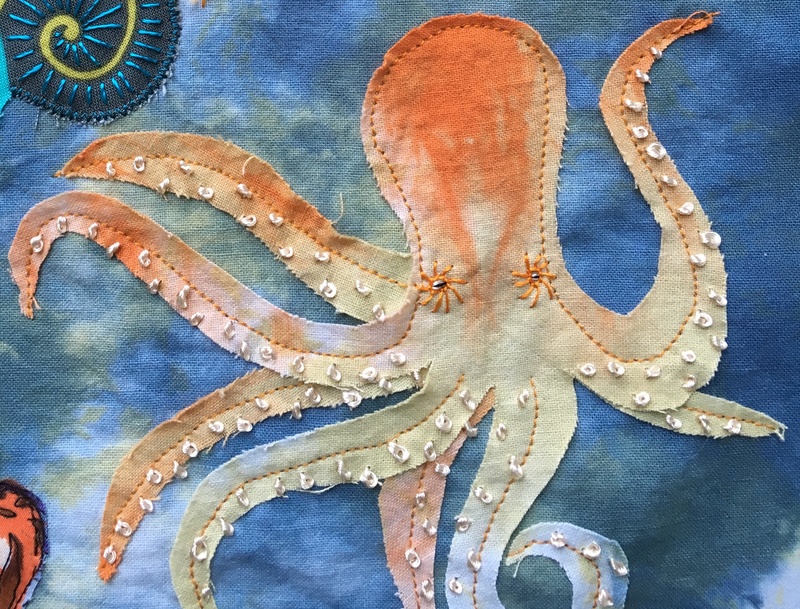 I didn’t have to worry about whether the metallic threads would hold up to use, or whether the long embroidery stitches would snag on anything. I didn’t have to finish all the edges of every piece of fabric. It didn’t have to be machine washable, warm, comfortable, or something I’d want to be seen wearing in public. It didn’t have to be biologically accurate or to even make sense in any way. I could make it as silly as I liked. I could do whatever I wanted and call it finished when I got sick of it. What started as a project I felt obligated to do (because everyone else in the family was contributing to the art installation) turned out to be a joy. I spent twice as long on it as I originally intended and, though I’m not sure it particularly counts as Art with a capital A, it makes me smile when I see it on the wall. Maybe it was useful after all. It rained all weekend, so what was I to do but bake and sew for two days? It felt decadent, indulgent (though I did get my weekend chores done; I wasn’t a total slacker). It was a rewarding weekend, too. My fabric stash has been getting out of control lately. I only buy fabric when I have a project in mind, but there’s always a little left over from any project, and it builds up. Not enough to make clothing for me or my now adult-sized kids, but enough for clothes for little kids and babies. So this winter I’m on a mission to reduce the stash by making clothing to give to charity. On this chilly, wet weekend, I started in on my scraps of polar fleece. 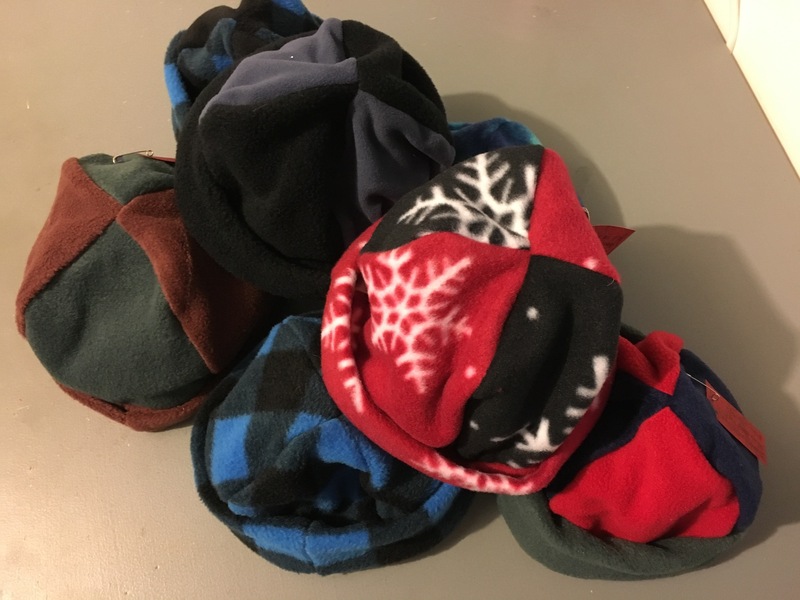 I made a whole raft of warm hats, and cut out the pieces for five little jackets (I need to get zips for the jackets before I can sew them). It was great fun turning all that ‘waste’ fabric into useful items. Next weekend, I hope to start in on the knit fabric—I have patterns for baby t-shirts that’ll be perfect for using up those scraps. And then there’s the denim, cotton broadcloth, corduroy … so many fabrics, and so many creative possibilities, once you think small. I managed to cut my polar fleece volume down by half—my stash reduced to pieces useful for my own clothes. If I can do the same with all my other fabrics, I’ll be thrilled. I get more space in my cupboard, I get to indulge in sewing I enjoy doing, and someone in need gets new clothes. It’s a win for everyone. August is always a month of frustration for me. On the one hand, I’m excited, because spring planting starts, and though the weather might not be the best, there is the promise of spring on its way. But with the promise of spring on its way is the threat of winter being over. I look at the gardening tasks ahead, feeling overwhelmed and wanting to get cracking on them. But I look back at winter and feel I haven’t accomplished nearly enough while the cold weather lasted. All those sewing projects that I meant to get to, that extra writing I had hoped to do in the long dark evenings, the photographs I meant to print and put into the family photo album…August reminds me that the time for finishing indoor projects is running short. It’s not that I didn’t do anything over winter. I was busy sewing, knitting, and writing. But there simply aren’t enough winter days for me to accomplish everything on the to-do list. When August comes round, I have to resign myself to not getting things done. I have to prioritise. That photo album? It’s been three years since I’ve put a picture in it. Looks like it’ll have to wait one more year. The jacket I wanted to make for myself will take backseat to the one my son has asked for–he needs it more. The pair of socks I started knitting last winter…well, I still have hope I’ll finish that project. Half of me is ready for spring. Eager for warm sunny days to whip the garden into shape. The other half of me wants a succession of rainy weekends so I can finish all those winter projects. The only reasonable thing I can do is make the most of whatever the weather gives me in August. If it rains, I’ll dive into the sewing with gusto. And as soon as the sun comes out, I’ll don gardening gloves and head outside. And if the weather is so fine, it begs for an adventure, I’ll leave everything on the to-do lists for another day. You could call me stubborn. It would probably be more accurate than the more polite persistent. But sometimes stubbornness pays off. I’m lousy at it. Really. I was first taught how to knit before the age of ten. I still couldn’t knit my way out of a wet paper bag. Specifically, I will knit socks. I know, I know. Socks are not the sort of project a non-knitter should attempt. They’re bound to end in tears. And they have, over and over again. The only thing missing is socks. Once all your other clothes are custom-made and fit perfectly, the ‘one size fits most’ socks they sell in the stores feel like they were made for aliens. I need socks that fit. Which means I need to learn to knit socks. Not just any old socks, but socks that are perfect for my feet. So, how many socks have I knitted in the past 37 years since my first knitting lesson? But, as I say, I’m stubborn. 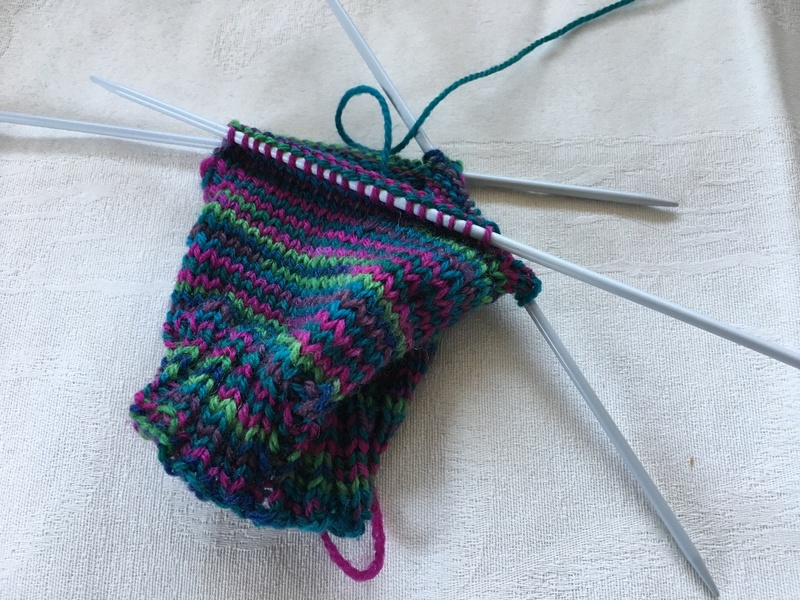 I’ve never been able to knit in the round (which, of course, dashes my chances of making socks), but with fresh stubbornness this winter I had another go. After several blood-pressure-raising sessions, I have knitted SEVEN CENTIMETRES of sock! Think of it. SEVEN CENTIMETRES! Give me another 37 years and I might make it to the heel of my first sock!